In 1925, Carl Theodor Dreyer was a thoroughly international filmmaker, having helmed productions in Germany and Sweden, but he still felt loyalty to his native Denmark and wanted to work there. Unfortunately the Danish industry had imploded, and only one company, Palladium Film, was struggling along, with an output of modest comedies. Master of the House may have been designed to fit in with Palladium’s production system, being a domestic yarn that barely strays outside a single family home, but in terms of tone, Dreyer has subverted the form – there aren’t many laughs to be had in his film, but it’s an acutely observed, passionately felt proto-feminist fable, that puts family life under the microscope. The plot is extraordinarily simple, to the point that it can be restated as a fairy story halfway through the film. Mr Frandsen (ironically named Viktor) lords it over his household with supreme authority and zero appreciation of his loving wife. A failure in business, he amuses himself by inflicting excessive punishments on his young son, and working his wife and daughter to exhaustion, while heaping scorn upon their efforts at every opportunity. A shot of him blowing smoke at his wife’s caged birds perfectly encapsulates his brutish tyranny. Dreyer extends the opening act of his little drama to an agonising length, anatomising the workings of the home and allowing the audience time to build up a seething resentment towards the arrogant bully, while also sewing the seeds of understanding. Mrs Frandsen is an all-too willing doormat, defending her husband from any criticism, and organising every aspect of the home around his convenience. Thanks to her tireless efforts, the Frandsen residence truly is a “machine for living in” – when Dreyer tracks across the cheeseboard preparations, he makes the kitchen seem like a domestic conveyor belt, manufacturing breakfast. His wife Ida’s constant labour has the apparatus running so smoothly that her husband is completely unaware of the work involved, and only dimly cognisant of his wife and family as human beings. Their capacity for emotion is only acknowledged insofar as it becomes useful when he wants to make them suffer. Brooding witness to this situation is another of Dreyer’s run of powerful old women, who sometimes seem equipped with near-supernatural powers. Viktor’s former wet-nurse, played by the impressively solemn Mathilde Nielsen, her face like a pudgy fist, suffers in silence until empowered to intervene by Viktor’s mother-in-law. The Matriarch spirits her daughter away to a secret location, and leaves the man of the house at the mercy of a new administration. The indomitable nurse stages an instant revolution, with Viktor reduced to the bottom of the social structure, his pathetic attempts to retain a control that was always illusionary dismissed with indifference. Viktor’s subjugation, and eventual re-education, are both immensely satisfying after the long sequence of his jackbooted dominance, and surprisingly moving, as a basically decent man slowly and very reluctantly realises what an appalling monster he’d become. To contrast with the simplicity of his narrative (two acts and a brief coda, rather than the traditional three), with its storybook straightforwardness, Dreyer aimed for absolute realism in his set, ordering it fitted with working gas, electricity and running water. He details the scenes of domestic toil with documentary exactitude, both to create a powerful impression of reality, an exhausting evocation of endless, devoted drudgery, and a set of routines that can be briskly turned on their heads when the nanny takes over, giving a magnificent sense of liberation after the long winter of slavery. Dreyer believed in discovering a new style appropriate to each film he made. Here, almost every shot is cocooned in a dark vignette, creating the feeling of a cosy – or suffocating – womb. The stark clarity of his wide shots allows him to gradually map the house from every angle, giving it the solidity and depth of a real apartment. Closer shots are favoured especially to show the apparently omnipotent and omniscient nanny spying through ajar doorways to see how her harsh new regime is reducing the once-supreme Viktor to a more realistic size. Rather than detail the husband’s debasement and redemption with the same obsessive attention he’s devoted to the reign of terror, Dreyer allows several ellipses to sweep us through this part of the story, almost as if he wants to deny us the right to gloat at the thug’s comeuppance. 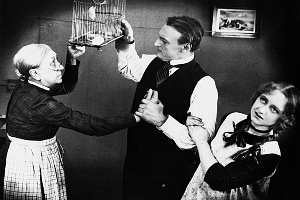 At the same time, considerable suspense is created by Viktor’s attempts to escape his fate by bribing his daughter into revealing Ida’s whereabouts. Like a recovering addict, he is able to see the possibility of release from his vice, but still seeks to hang onto it. The film scores points with its honesty, here and elsewhere. Ida falls gravely ill as soon as she is removed from her cycle of ceaseless toil, and we recognise from real-life experience how accurate this is: the accumulated stress of life and labour often only catches up with us when we stop what we’re doing and take a look around. Somehow it’s surprising to find a universal truth observed so sharply in a film from 1925. It shouldn’t be.